Concert classical guitar, Yamaha GC-5 made in 1970, very good condition, hasn't been played a lot. Solid spruce top, solid Brazilian rosewood back and sides, perfect straight neck. Big dark sound, lots of mid range overtones. In original case. This is a lovely instrument built by veteran US luthier Michael Thames, who has been making guitars for over 40 years. The guitar is reminiscent of a Friederich, outwardly the head shape is like a model of the 1960s. Solid Indian rosewood back and sides, solid cedar top with an older professional repair, which is absolutely stable. The sound of this Thames is very rich and dark like a Fleta, yet has great balance and clarity between voices. The 66 cm scale improves sustain and volume, particularly in the trebles and midrange notes, the bass is also very powerful, and provides additional projection for the recitalist in the concert hall. Overall a very fine concert instrument. The guitar bears the original maker's label, which reads: Michael Thames, Luthier, # 143, 1991. 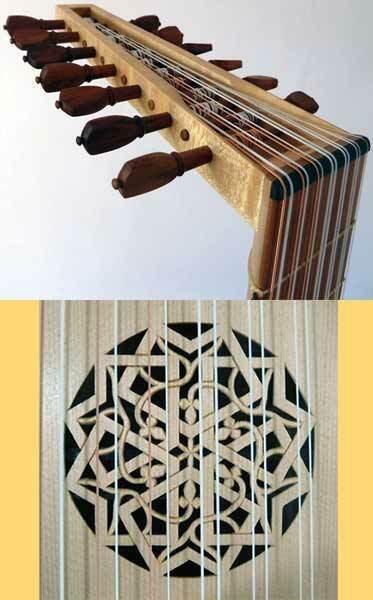 The fingerboard is ebony with good frets and the neck is perfectly straight. 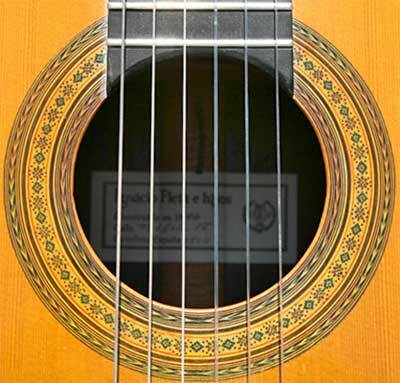 The French polish is worn in many places, signs of playing wear. The original handmade Landstorfer tuners are fantastic and in perfect working condition. The string action is set low, and it plays like butter, with a good height in the saddle remaining. The original arched hardshell case is included. 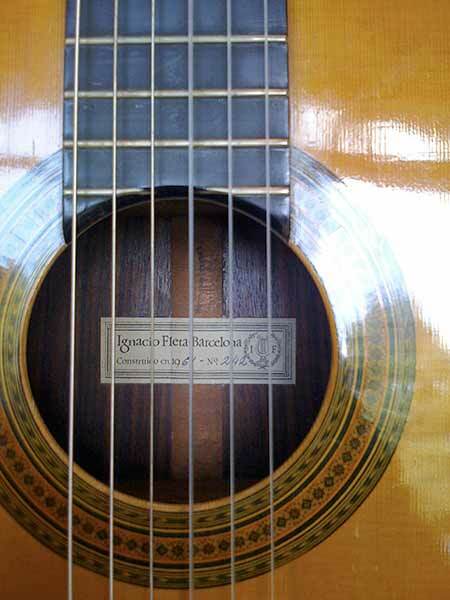 Concert classical guitar by Ignacio Fleta in perfect condition - as when it left the workshop. Cedar soundboard. Indian rosewood back and sides. 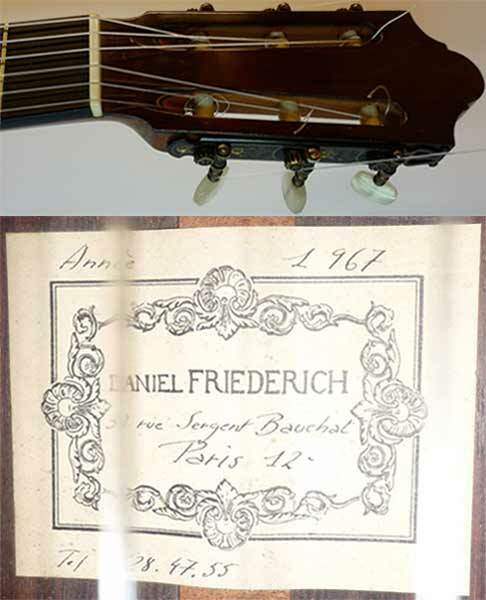 Daniel Friederich 1967 Recital model, string length : 65cm. Cedar top, Brazilian rosewood back and sides. Perfect playing condition. Condition: The neck and body are near mint condition while the top shows some very superficial playing wear, amazing for a 24 years old concert guitar. The construction of this guitar is impeccable and produces an instrument that is really quite loud and projects very well while maintaining tonal balance, fullness and warmth. Smallman guitars from the late 80's and early 90's are the most sought after. Many top classical artists have used Smallman guitars, with John Williams one of the most famous This particular instrument was made for concertist Julian Byzantine who used it on numerous concerts and records. New 7 course renaissance lute in G after Venere, Bologna, made by George Stevens. Spruce soundboard with hand carved rose; back in striped English cherry with pearwood lines between; neck, pegbox and bridge in English sycamore; plumwood pegs; fingerboard, points, bridge-cap and soundboard half-edging in pearwood. Acoustic Steelstring Guitar in perfect original playable condition with an amazing sound. No cracks or repairs at all. 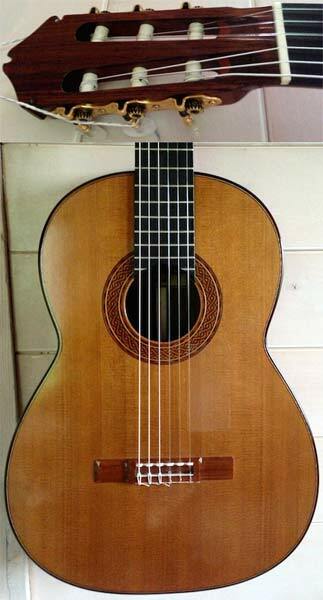 8-string master concert classical model, bearing the original label: Constructor De Guitarras, Jos� Ramirez, Concepcion Jeronima No 2, Madrid, 1971, classe 1a n�4746, red cedar top, breathtaking Brazilian rosewood back and sides, scale 66.5 cm, nut 7 cm, original capo and case. A very nice antique 6 course (12 strings) Oud bearing the original maker's label written in Arabic stating the name of the Syrian luthier, the city of Damascus and the islamic year 1344 (1925-1926). 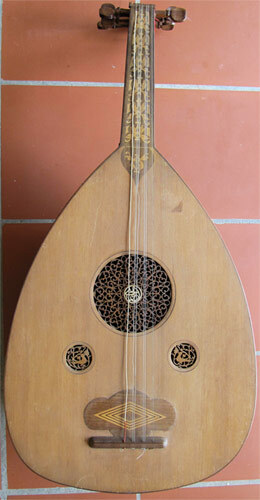 Top with 1 large and 2 small soundholes with rosette, 4 unrepaired hairline cracks, round back with 15 ribs interspersed with different kind of wood stripes (some seams open), neck made of different kinds of wood, fretless fingerboard inlaid with wooden ornaments, head with 12 original pegs. A powerful custom hybrid jazz guitar by Allan Beardsell, model 4G with premium options: mastergrade sitka spruce, bigleaf quilted maple. As expected with a guitar from one of the most inventive guitar builders in the world, this 4-G is a piece of art with fantastic playability, beautiful sonority and the looks way beyond the millions of boring guitars. This 4G is used and has some nail marks and one dent in the top, otherwise in very good condition.  The neck is perfectly straight and the action low. "The 4G is the latest variant of the 4A, my original design for the side-ported guitar. The G guitars have a deeper body, wider waist and laminated "platform" sides, plus all the usual features offered on my acoustic guitars. The 17" body offers a full range of sonic possibilities. When I was playing acoustic guitars in clubs and auditoriums, I would be playing behind singers and sometimes with larger bands, going between fingerstyles and flatpicking. I was having a hell of a time hearing the guitar as a dynamic voice. When I was hearing only the electronic foldback in the monitor, I would end up playing as hard as possible all the time just to feel present in the mix on top of the compressed character of the pick up. It meant my playing suffered and I broke a lot of strings. This got me thinking about projection and volume, resonance and how these things define the way we interact with, respond and use a musical instrument, especially these days when amplification is virtually a given. I wanted to figure out how to create a situation, where the instrument speaks to the player first, with all the dynamic of an acoustic performance -- that's where the side ports come in." 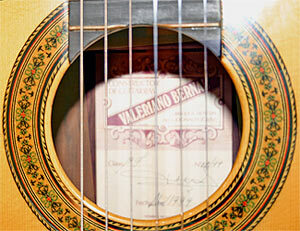 A Flamenco Negra Guitar, hand made in southern Spain by Valeriano Bernal. I purchased this guitar from the maker himself in 1999 at his workshop in Cadiz, Spain. It was his top of the line guitar at that time. The back and sides are made from special quality rosewood, the top is German spruce, I believe the fretboard is ebony. The piece is signed, numbered and dated. I still have the original receipt. Comes with the maker's standard hard shell case. A concert classical guitar in perfect condition - no cracks - almost as when it left the workshop. Spruce soundboard. 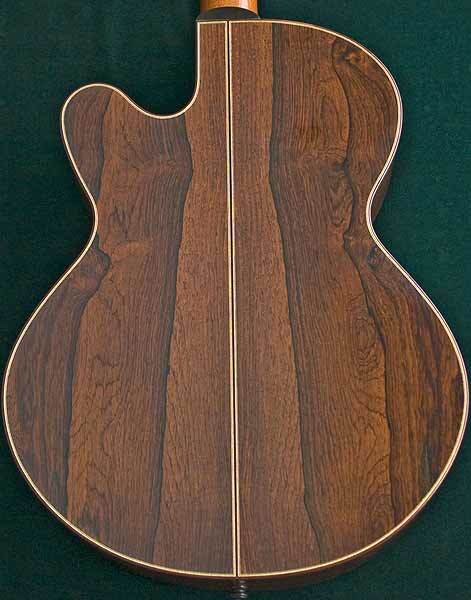 Brazilian rosewood back and sides. Original French polish. A concert classical guitar in perfect condition - as when it left the workshop. Cedar soundboard. Brazilian rosewood back and sides. A rare custom made hybrid classical/steel string guitar with an extra wide neck and a cutaway, bearing the original label and singnature: Oskar Graf Luthier, 9/1994, Clarendon, Ontario, Canada. 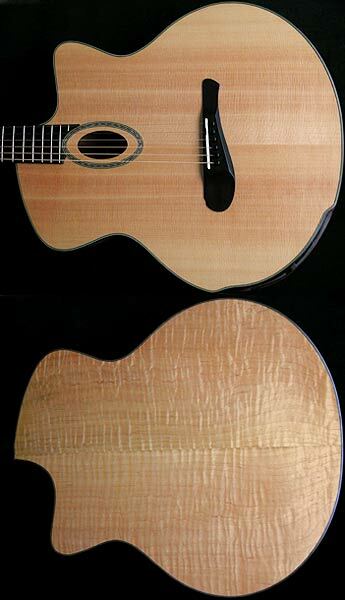 The neck is made for a classical guitar player 4.8 cm (1 7/8 inches) at the nut, but also radiused like a jazz guitar. There are 2 nuts, # 1 at 3.7 cm (1 7/16 inches) string spacing and # 2 at 3.9 cm (1 8/16 inches). The scale is 65 cm ( 25 9/16 inches). Perfect straight neck with trussrod and ebony bound fingerboard which is fitted with jumbo frets that show some wear, but no fret notching. The Brazilian rosewood for the back and sides are of the highest grade and came from an old stack in London. The back has 3 tiny hairline cracks at the bottom (closed and firm), which where there when we chose the set, and where treated by Oskar before building the guitar. 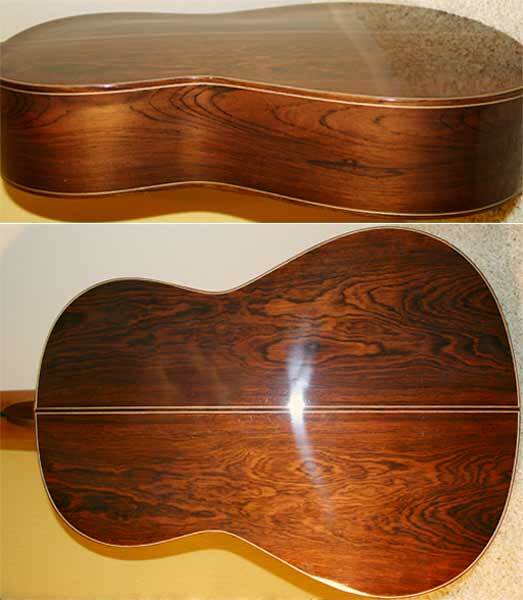 The tight grain cedar top shows some light playing wear and the outline of a guitar top protector which was on it for some time, but has been removed. Now the most important point, the sound. very loud, on the dark side, lots of midrange, endless sustain, unreal sonority, it actually sings like a bird. Every string is the same including the G and all the way up to the very end of the fingerboard. The action is set at 2 and 3 mm, and that is as low as can be, not because of the neck or the saddle (4mm left in the middle), but because the strings vibrate so much, that it would buzz if lowered. The neck is so comfortable, that I am even able to play Villa Lobos' Chorus no 5 with this steel string guitar without difficulties. The original hardcase is included. A concert classical guitar in very good condition. Fully playable. Some minor wear where the right arms rests. 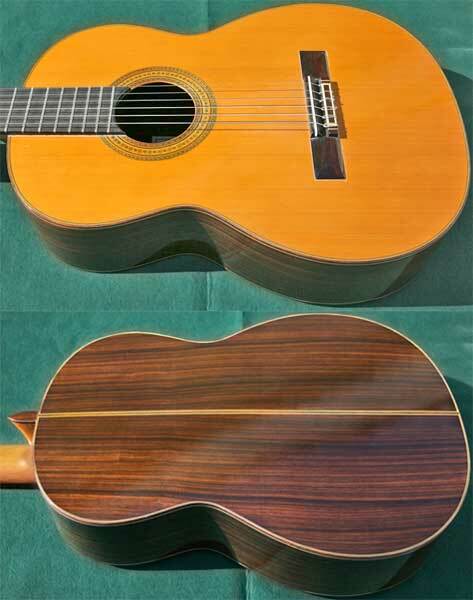 This Spanish concert classical guitar is a rare model called Hernandez y Aguado by Marcelino Lopez and bears the original signed label: Marcelino Lopez, Luthier, No 953, Ano 2007, Madrid. Also stamped below the heel H A. Cedar top with very light playing wear, Indian Rosewood back and sides, good straight mahogany neck with ebony fingerboard and good brass frets, carved Hernandez y Aguado head. The sound of an old time Spanish guitar but very loud and good midrange and unusual soft tone for such a powerfull guitar. The action is a little bit low for a guitar with that volume (3mm/4mm). A professional player with strong hands will need a higher saddle. Original hardcase included. According to Lopez himself, he was asked by Hernandez in 1971 to build a guitar for him, who was very pleased with it and ordered more and more. 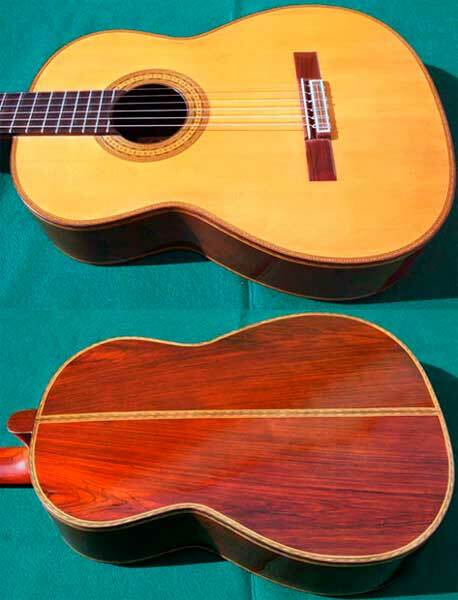 After some time Hernandez asked Lopez to build an exact copy of his own guitar (the original Hernandez y Aguado guitar) which is what he did after quite some time of examining this guitar. Hernandez was extremely pleased with it. From 1971 until Hernandez died, Lopez built 30 guitars for him. 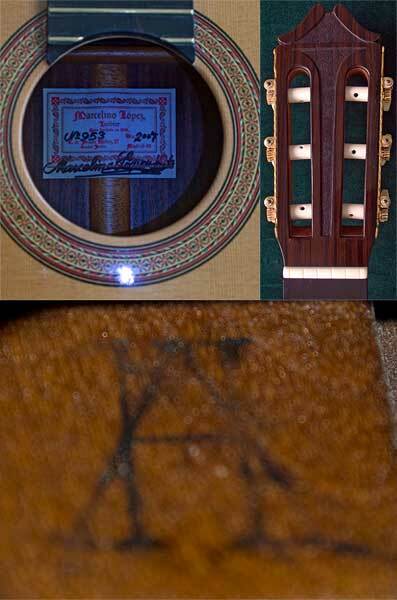 This guitar is a copy of that Hernandez y Aguado model Marcelino Lopez built for Hernandez, therefore the stamp inside: H A. They are built to order with a price tag of over 8000 Euros. 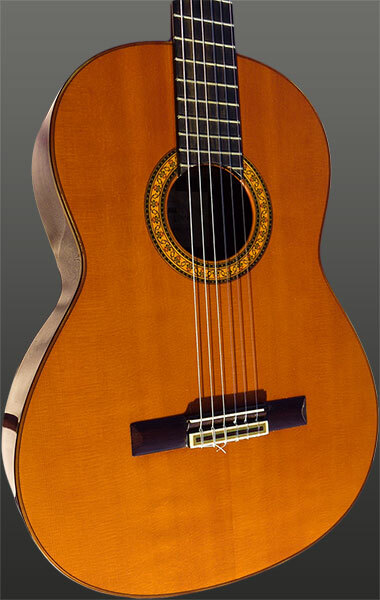 10-string master concert model, bearing the original label: Constructor De Guitarras, Jos� Ramirez, Concepcion Jeronima No 2, 1882 Madrid, 1972, clase 1a, top stamped inside near the neck #2 which stands for the Luthier Cayetano Alvarez Luna (according to the information provided by The Guitar Salon). Solid red cedar top with a nearly invisible professionally repaired hairline crack from the bridge to the lower rim, absolutely breathtaking Brazilian rosewood back and sides of a stunning chocolate color with rich and dramatic 'spider webbing', even more surprisingly there are no cracks or checks in the wood, a "Segovia" style cypress double inner side veneer, very good straight mahogany neck, ebony fingerboard with good frets, very good action, plays easy, the lacquer still has the appearance of a new guitar with only a few nail marks near the treble side, scale 67 cm, nut 8.5 cm, original capo and case. 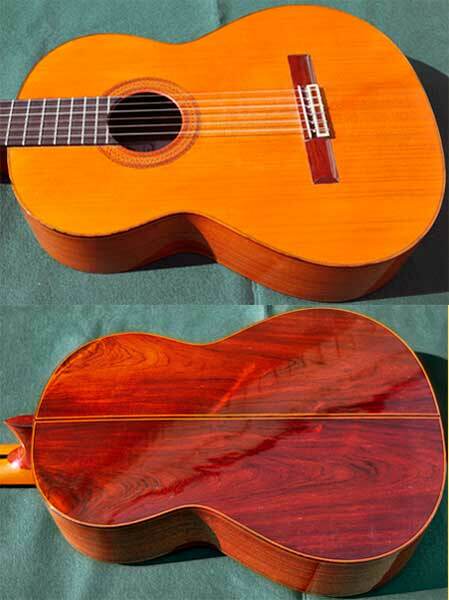 A 1961 Spanish concert classical guitar by Ignacio Fleta in perfect condition, made by Ignacio Fleta Sr.
Top - German spruce, Back and Sides - Indian rosewood, Scale - 650mm, Nut - 52mm, Finish - French polish, Tuners - Fleta, Country - Spain, Year - 1961, Number - 242, Condition - Perfect condition. 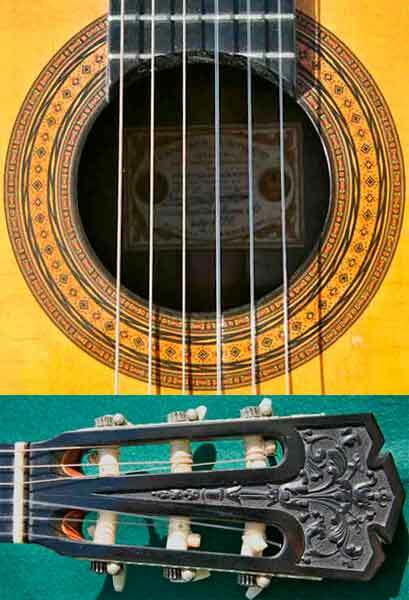 An early example of a large, 67 cm, scale Spanish concert classical guitar made by the Conde Hermanos. 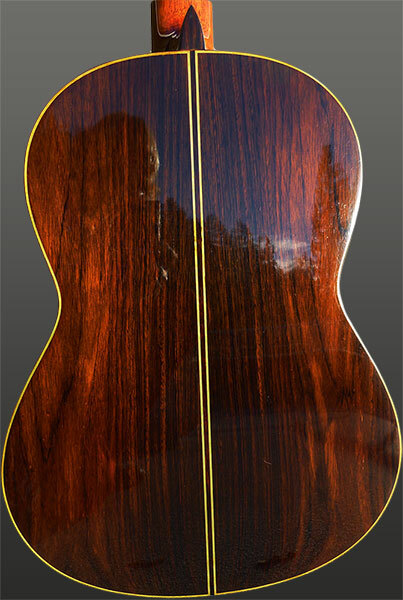 Dark solid Brazilian rosewood back and sides with tight straight grain. Spruce top. Part of the label was removed, when the center strip was replaced. The label is dated 1956, and if complete would read: Vda. y Sobrinos de Domingo Esteso, Construccion de Guitarras, Gravina 7 - Madrid, Ano 1956. 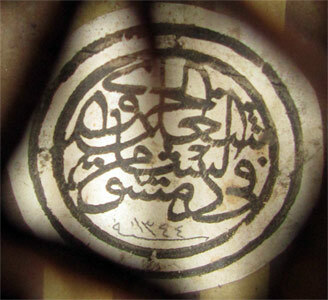 There is also a brand stamp inside close to the heel: Vda. y Sobrinos de Esteso, Construccion de Guitarras, Gravina 7 - Madrid. The back has an earlier center seam repair and a repaired crack (14 cm). The top has some discolored circles underneath the lacquer. The neck is slightly bent and the frets are not great. Playable with medium high action (5 mm). Tuners work fine. Measurements: - total length 100 cm - scale 67 cm - body length 49 cm - upper bout 28.5 cm - middle bout 25 cm - lower bout 37.3 cm - lowest rim 9.2 cm - highest rim 9.8 cm - nut 5.2 cm. 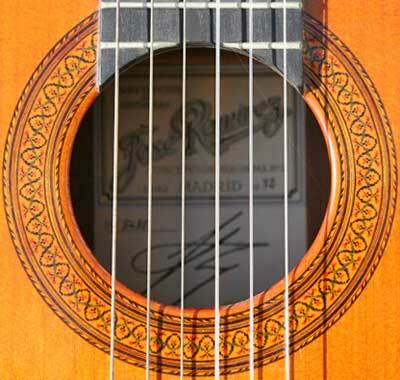 A Spanish concert classical guitar bearing the original label: Jose Ramirez, Madrid. Solid spruce top, solid rosewood ? back and sides, playing wear on the top, looks refinished, good neck, scale 64.5 cm, nut 5.2 cm, sold as is.